As part of the Mel Bay Encyclopedia Series, the purpose of this book is to offer fiddlers direct access to the gems of the genre. Composers represented in this volume span a three hundred year period including works by: Patrick MacDonald, Adam Craig, Capt. Charles Duff, Simon Fraser, Robert and Joseph Lowe, Robert MacIntosh, William Marshall, and J. Scott Skinner. Ms. Rideout's original compositions are also included. The tunes are listed in order by key signature to enable the fiddler to put sets together for performance, competition or session playing. This book contains extra marches and strathspeys unique to Scottish fiddling. The end of the book is dedicated to solo numbers consisting of piobaireachd (pibroch) and slow airs. 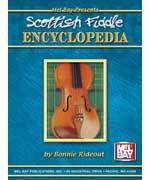 The Scottish Fiddle Encyclopedia is an essential tune book for musicians interested in developing a deeper appreciation for genuine traditional Scottish fiddle music.